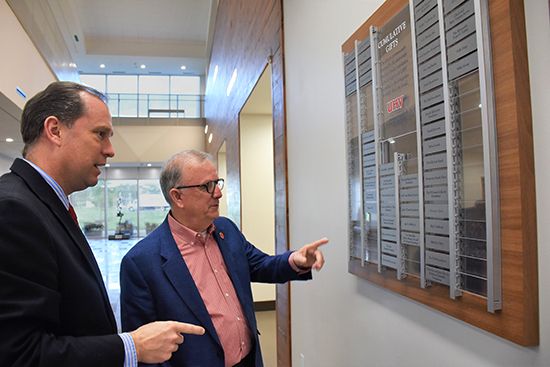 UHV President Bob Glenn and Jesse Pisors, UHV vice president for advancement & external relations, discuss on Monday the four new plaques and names added to the UHV Donor Recognition Display in University North, 3007 N. Ben Wilson St. The steel plaques permanently honor the Trull Foundation, Rebuild Texas Fund, Bennett-Wood Family, and Claud and Mary Virginia Jacobs for their cumulative gifts of $50,000 or more to the university. Also added to the wall was a donor feature highlighting UHV alumna Josie Rivera and information about her. In addition, updates were made to the display’s Cornerstone Circle with the names of those who donated $1,000 or more during 2017-2018, as well as a section dedicated to faculty and staff donations made to UHV during the 2018 fiscal year.